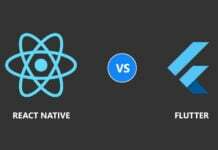 Home Mobile Programming React Native vs Flutter: which is better? 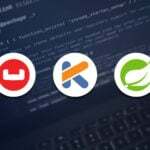 React Native and Flutter are among the best mobile app development frameworks. Both of them are from big players named Facebook and Google. 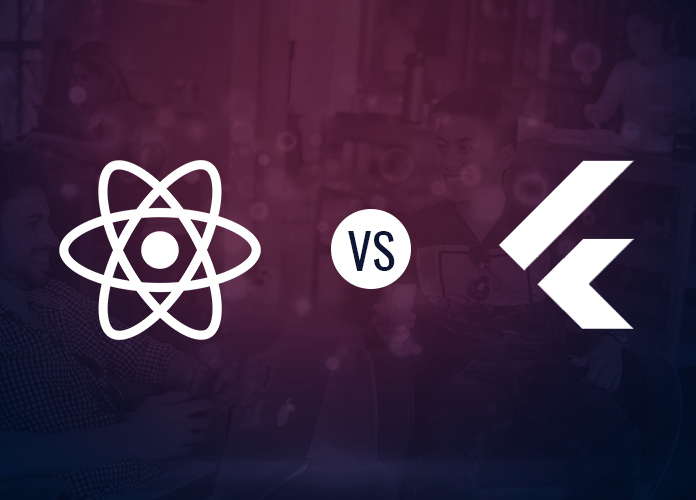 In this article, we will have a comparison between React Native and Flutter. 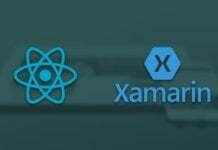 There are several mobile app development frameworks in the market such as Xamarin, Ionic, and so on. What’s so special about React Native and Flutter? And which is better? In this comparison guide, I’m trying to answer these questions. After reading this post, you will get a basic idea of these frameworks and it will be easy for you to select the right framework for your business. React Native: React Native is an open-source mobile app development framework developed by Facebook, which is used for building iOS and Android apps. This framework was released in March, 2015. It’s a free tool. Flutter: Flutter is also an open-source mobile app development framework. It’s developed by Google. It’s used for developing iOS and Android apps. 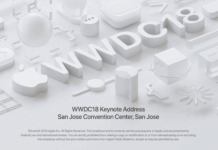 Flutter was released in May 2017. It’s a free tool. React Native: React Native is famous for the performance it offers. 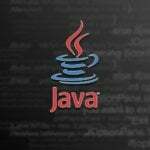 It provides near-native performance. So if you build an app with this framework, your app will be super fast. Although it gives a great performance, you can always try to improve it because app performance is very important for your business success. React Native allows you to write code in Native languages such as Swift, Objective-C, and Java. So you can build some part of your app in React Native while the other part can be built using Native code. In this way, you can achieve excellent performance. Flutter: Flutter also provides great performance. When you’re building an app with Flutter, you don’t have to worry about app speed because this framework will give you the performance that will satisfy the app users. So like React Native, Flutter is also a good choice for building a fast application. Just like React Native, Flutter also lets you use native code to achieve great performance. Widgets include platform differences like scrolling, navigation, and fonts. So you will have a smooth performance on all platforms such as Android and iOS. React Native: As React Native gives you the freedom to work on any text editor / IDE that you like. So you can choose a text editor that saves you time. Besides, React Native provides you with pre-built components that let you finish your project fast. React Native has a special feature called ‘Hot Reload’ that saves you a lot of time. Using this feature, you can instantly reload your app, without having to recompile the app. Recompiling the app will take a lot of time. So instead of recompiling it, you can simply hot reload it. In this way, developer’s productivity gets increased with React Native. You can accomplish more in less time with this framework. Flutter: The Hot Reload feature is also available in Flutter. So using this feature, you can save a lot of time with Flutter, too. There are several widgets and APIs in Flutter which let you finish your development work quickly. So we can say that with this framework also, you can work in a productive way. So you can save a lot of time while building a mobile app, which is a big advantage for your business. React Native: React Native has sufficient, high-quality documentation on the official site. There are also a great number of learning resources such as tutorials, articles, and blog posts on the Internet. 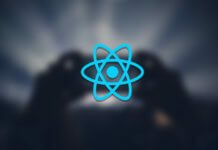 With a great number of learning materials available online, you can master React Native fast. If we search for react native tutorial on Google, we get 64,70,000 results, as of writing this post. Flutter: Flutter is also a framework that has a lot of high-quality docs available on its official site. Besides, like React Native, you will find lots of useful resources on the Internet. 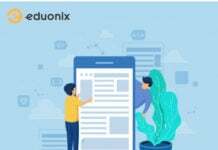 As both are in huge demand in the field of app development, there are a lot of great quality materials available on the Internet, for both the frameworks. If we search for flutter tutorial, we get 97,40,000 results, as of writing this post. React Native: React Native has a strong community support. On GitHub, it has 66,693 stars and 1,692 contributors who are working on React Native to improve it. 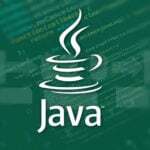 As this framework has a large community of developers from across the globe, you can take help from them by asking questions on QA sites and forums. Flutter: Flutter also has a good community support. On GitHub, it has 33,248 stars and 223 contributors making the framework better. They are working on different areas of Flutter to give you a great development experience. Flutter developers are also active on QA sites and forums. So you can take help from them. 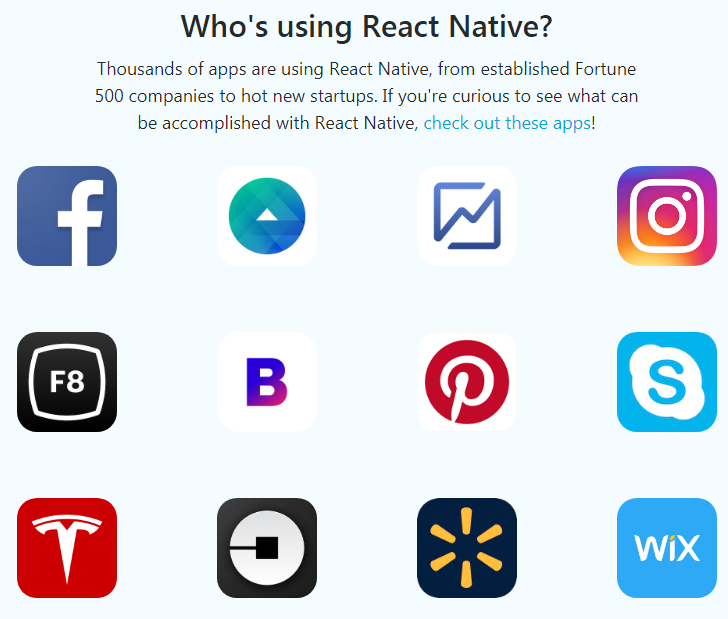 React Native: Some popular mobile apps built with React Native are Facebook, Facebook Analytics, Instagram, Facebook Ads Manager, Skype, Pinterest, Uber, Tesla, Walmart, Artsy, Bloomberg, F8, Discord, Chop, SoundCloud Pulse, Vogue, and so on. 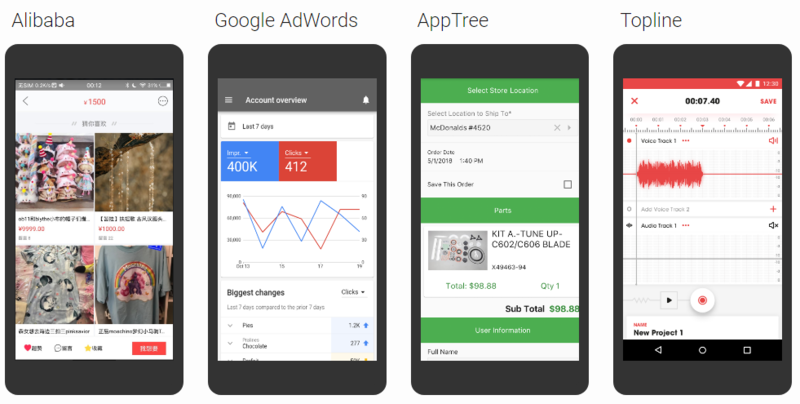 Flutter: Some popular mobile apps built with Flutter are Topline, AppTree, Alibaba, Google AdWords, Reflectly, Google Greentea, Hamilton Musical, Birch Finance, OfflinePal, Hookle, BetaBubs, and so on. Both of these frameworks are used by great companies and hot startups. Why are these great companies trusting React Native and Flutter? Obviously, because both are amazing tools for building rich mobile apps. Although both are great tools for building mobile apps, not everyone likes them both. Some people prefer coding in React Native while others like Flutter. Consider the comparison factors discussed in this post to understand which tool would be good for you. 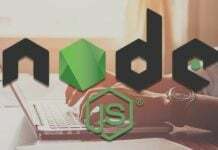 You may also visit the official sites of these frameworks to get a better idea of them. Once you have enough knowledge of them, it will be easier for you to choose the right one for your business.